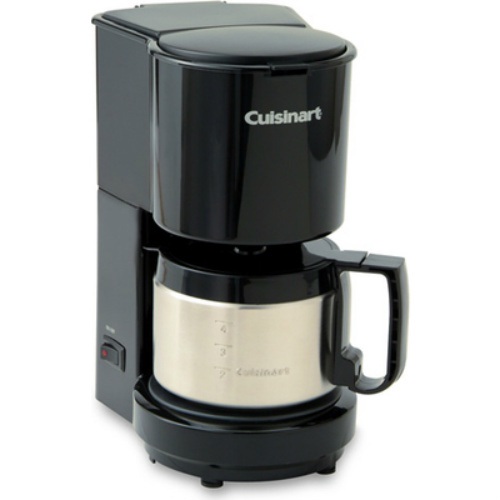 The Cuisinart DCC-450 4-cup coffeemaker with a small footprint, is ideal for a small household or a second home. This coffeemaker from Cuisinart is designed for one or two persons and makes four cups. The stainless steel carafe keeps coffee hot and features generous handle, knuckle guard and dripless pour spout. The DCC-450 features popular Brew Pause function that lets you snag a cup while in the process of brewing. The coffee maker also has a 30-minute automatic shutoff and an "On" indicator light for complete peace of mind. The 4 Cup Coffee Maker Black Stainlss has many exciting features for users of all types. You can extend the lifetime of your 4 Cup Coffee Maker Black Stainlss with the purchase of a FactoryOutletStore Factory Protection Plan. See the 4 Cup Coffee Maker Black Stainlss gallery images above for more product views. 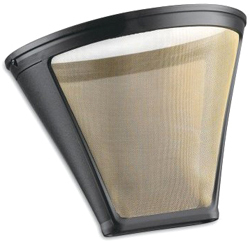 FactoryOutletStore stocks a full line of accessories like Replacement Filter for the 4 Cup Coffee Maker Black Stainlss. The 4 Cup Coffee Maker Black Stainlss is sold as a Brand New Unopened Item.